This article will discuss how water analytics can be used to optimize water usage with smart meters in conjunction with advanced analytical software. It is one of a five part Water Tap series including Water Analytics, Water Recycling, Desalination, Advanced Water Technologies, and The U.S. and Singapore Water Tap Comparison. Water analytics provides a partial solution to the growing, world-wide, water shortage issue. The problem is widespread. Across the globe, 700 million people currently lack access to safe drinking water. By 2025, an estimated 1.8 billion people will live in areas plagued by water scarcity, with at least half of the world's population living in “water-stressed” regions. . The United States is no exception. From New York to California, large metro areas face water scarcity issues due to dense, growing populations. The inner states along the agricultural belt face similar issues as farmers there are increasing crop outputs and demanding more fresh water to irrigate them. The cause of the problem partially involves over-usage. The United States uses 450 billion gallons of fresh water every day largely to water crops, cool electrical equipment, create products, and supply home faucets. On average, this amounts to about 185 gallons per person, per day. On the bright side, much of this water can be used significantly more efficiently through use of careful analytics and asset management. Realizing this, the water industry is undergoing a huge change; from an operation largely dominated by low-tech elements such as earth movers, pipes, and pumps to a modern, streamlined, and highly accurate science governed by high-frequency readings of sensors , careful analysis of data and meticulous planning. The necessity to make smarter use of the limited fresh water supply worldwide is prompting these innovations. In the U.S., federal and state R&D tax credits are available to shoulder the costs to smarter and leaner water consumption. Water analytics is a term used to describe the analysis and monitoring of water usage in order to manage resources more efficiently. It is used by both consumers and utility companies to gauge consumption, measure water pressure, and pinpoint leaks in the system. Data mining tools and statistical analysis are employed to extract meaningful information from automatic meters and sensors. The potential benefits include water conservation, increased operational efficiency, maintenance, cost control, reduction of pollution, improved waste-water treatment policies and more. Global demand for fresh water is set to exceed current supply within the near future. Analysts with Bank of America, Merrill Lynch, Global Research warn that, when it comes to global drinking water supplies, a “perfect storm” is approaching. Fresh water makes up only about 2.5% of all the water on earth. Of this 2.5% only about 33% is accessible for direct use. The remainder is frozen in the icecaps of Antarctica and Greenland or deep in underground aquifers that are nearly impossible to reach. The amount of available, suitable, drinking water may not be enough to support current population growth projections. The analysts at Bank of America believe that half of the world’s population will be dealing with “water stress” conditions – defined as when the available amount of water is exceeded by demand – by 2030. By 2050, 45 % of world projected GDP could be at risk. A 2013 survey, by Deloitte Consulting, found that 70% of respondents identified water as a substantial business risk, either in direct operations or supply chains. Companies with water supply challenges include obvious ones, such as Coca-Cola , and others who are not so obvious, such as Intel , which uses astonishingly large quantities of water to produce semi-conductors. Water shortages and scarcity are already a major issue in the U.S., particularly in the West. Population growth, economic development and the effects of climate change have raised concern about the water supply in the near future. When engineers designed the water infrastructure in arid states in the West, they assumed that future droughts and floods would follow historical patterns. Recent precipitation patterns however have since changed. Many areas in the Midwest have experienced significantly less precipitation than usual. Take California for example. The first half of 2014 was recorded as being the hottest in the state in 120 years of record-keeping . The chart to the right displays the drought issues experienced over the past year in California. According to the U.S. drought monitor, 82% of the state was in extreme or exceptional drought in September 2014, as indicated by the red and dark red patches on the map. California is not the only region to be affected by recent droughts. Drought monitor charts in other areas of the mid-west, such as Texas and Nevada look similar to the one displayed on the right with large, dark, red areas stretched across most of the state indicating “extreme” or “exceptional drought”. In order to deal with these unpredictable weather patterns, as well as increasing populations and larger water outputs, users and producers must make smarter choices involving water usage. Modest changes in water usage patterns could have large, positive implications on the water shortage problem. For instance, a reduction of just 4% in agricultural water consumption would increase the water available for residential, commercial and industrial uses by roughly 50%, according to the Wall Street Journal . Perhaps more significant is the enormous amount of water lost from leaking or damaged infrastructure. In the United States alone, about 700 water main breaks occur every day. This leaking infrastructure causes water losses that are roughly proportional to those across the world. Almost 50% of the world’s water disappears from aging and/or leaking pipes. 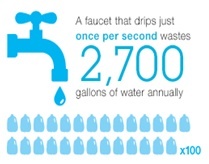 This amounts to an estimated $14 billion in wasted water each year . However, these enormous losses resulting from the failed infrastructure are not unavoidable. With the use of water analytics technology, smarter water management solutions can be made available for cities, businesses and utilities seeking to capture the potential from otherwise wasted water resources. Sensors can be placed throughout the infrastructure and natural waterways in order to feed data to analytics-driven technologies, enabling real-time tracking and reporting of conditions. As a result, patterns are exposed and problems are identified, which allows technicians and engineers to better maintain infrastructure, save water and lower costs. Imagine the savings from anticipating and preventing a water main burst, or using a computerized system to detect leaks which waste so much of our scarce water supply. Imagine utilities connecting with each other over the cloud in order to share information and innovation. Imagine consumers using smart phones to gather data and address problems directly at the source, providing real customer engagement and collaboration with utilities. Being smarter can change the way cities work and help deliver on their potential as never before. Water analytics will transform modern societies by using the same amount of water to meet an increasingly growing demand. Smart water meters provide users the needed tools to optimize water usage. Not only do they collect detailed data that allows users to spread the optimal amount of water across their precise needs but they also detect leaks, gauge pressure, and respond to real time dynamics. With smart water meters, utility companies and customers have the ability to receive and react to real-time information. Unlike before, they will receive up-to-date price signals, usage rates, and notifications of micro-leaks that would otherwise be undetectable. For instance, meters can send customers a message notifying them of a leak before the leak rings up water usage, plumbing services, and restoration costs. Utilities can make use of the data as well by analyzing certain trends among groups of customers and geographical areas in order to optimize service and efficiency. This is a capability that was unavailable with traditional water meters. The smart water meters are clearly superior to their ancestors. Traditional water meters provide very limited information. Not only are they less accurate and precise to begin with, but unlike smart meters they also tend to lose even more accuracy as they age. For example, a smart meter is highly sensitive to precise water pressure patterns, making it more accurate and comprehensive. In contrast, a traditional water meter measures total consumption of a building or home, meaning leaks are difficult to detect and customers can’t pinpoint inefficiencies. Another benefit of smart meters is the planning ability they provide. If water stress and drought are the new normal, the utility could use data from smart meters to institute drought pricing, allowing users to adjust their water use according to price signals through their meter. If there are periods of drought relief, water could be reserved through water storage projects. This provides much flexibility for homeowners and businesses who could decide on how much water to save in any given situation based on prices, past use, and predictive analytics. Across the State of California residents are being asked to decrease their water use by detailed percentages in order to cope with the drought. But unlike a dieter who regularly steps on a bathroom scale, water consumers who don’t have a smart meter can't track the gallons as they flow down the drain. Their effort to cut back, if they make one, is often educated guesswork. However, San Francisco is aiming to change that, becoming one of the first major cities to roll out technology that allows water customers to track usage, conservation rates, water pressure, and allocation among users so that they can make precise real-time adjustments to suit their individual needs. The program, which provides on-line access, is part of a $56 million initiative that has put new meters in nearly 180,000 homes and businesses, and it is expected to help residents achieve the city's voluntary conservation goal of 10 percent - a target the city has struggled to hit. The new meters in San Francisco track water consumption hourly and beam the data via a wireless transmitter to the San Francisco Public Utilities Commission headquarters downtown four times a day. Customers can view the data as it comes in, and compare their numbers with past use and city averages. A thick green line appears across a bar chart and shows users how they stack up with their peers. The program is expected to create a buzz among users who will likely generate ideas and strategies and then share them with their peers in order to save dollars while still meeting all of their water usage needs. How does my performance compare to that of my neighbors? How can I improve efficiency? What are the results of the current situation? Do I need to change priorities? How can I meet year-end budget/targets? Such information allows users to gauge precisely the amount of water that they need in order to meet their budgets and spread water more efficiently among their peers. Visualize: Bringing all of user’s data together in a common structure and displaying only the important information means more time is spent analyzing and acting, rather than searching. Monitor and Diagnose: A critical aspect of Smart Water Analytics is the ability for domain experts to view, monitor and diagnose issues in real time and translate operational insights into improved decisions. Plan and Adapt: Many times the difference between success and failure is a good plan. Good plans require operational insights about past and current performance, projections of possible future outcomes and the flexibility to adapt to changing dynamics. The Smart Water Analytics planning, forecasting and impact assessment capabilities can inform long-term strategies and capital project plans as well as optimize ongoing operational plans. Pipe Failure Prediction: Pipe failure prediction analytics help utilities anticipate which sections of their pipes are most at risk of failure. By knowing this information, utilities can establish a preventive maintenance program to replace or fix high-risk sections and to help avoid pipe bursts and leaks. The Ability to Better Manage Pressure and Leaks in the System: Water pressure is something few consumers think about. For utilities, however, water pressure is a top priority. Improper pressure management can result in the loss of more water through leaks, bursts, and higher energy costs—all situations that cause lost revenue and affect the bottom line. Reducing Water Use with Predictive Analytics: Predictive analytics is an area of statistical analysis that deals with extracting information from data and using it to predict trends and behaviors. This solution is expected to reduce water consumption by 20 percent. 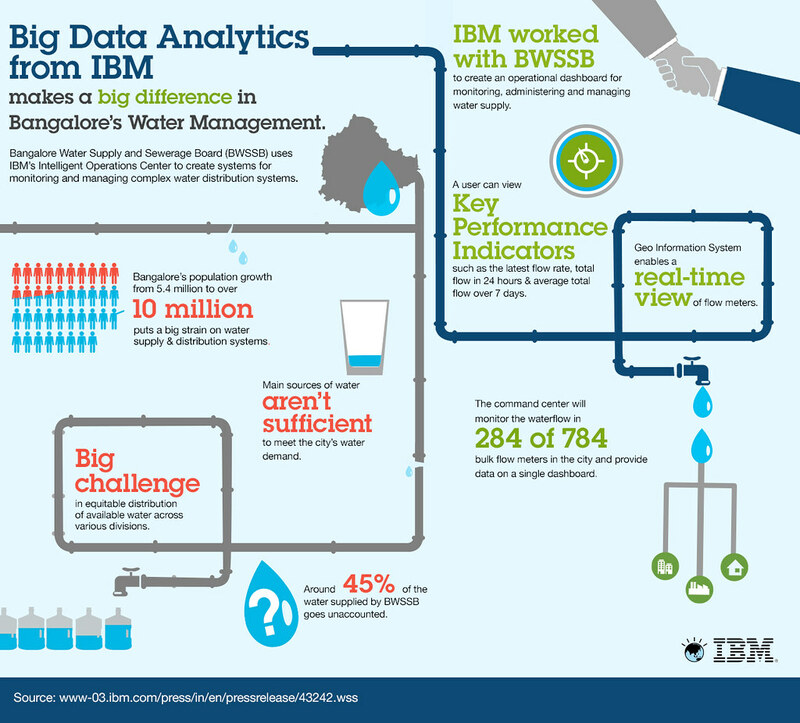 IBM is leading the forefront in water analytics discussion and implementation. Since the company’s “Smarter Cities Initiative” inception in 2009, IBM has established itself as a leading provider of smart city solutions, entering into key collaborations with local authorities across the U.S. The plan involves collecting data and leveraging its own technologies, such as cloud services, Big Data analytics and intelligent mobile operations to integrate smart public systems which allow for the efficient management of community resources. IBM recognizes that smart cities are a phenomenon, which will drive growth. Accordingly, it has designed its strategy to focus on the development of these types of cities. This of course, includes water analytics. 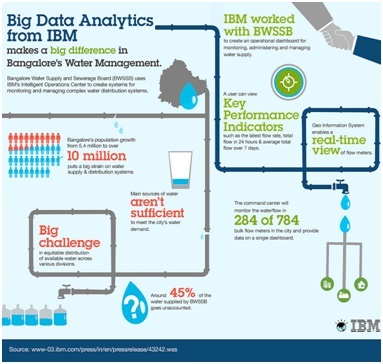 The chart below demonstrates how IBM has used Big Data analytics to assist the Water Supply and Sewerage Board in Bangalore, India (BWSSB) in addressing its water shortage issues. Bangalore’s massive population growth – from 5.4 million in 2000 to over 10 million and counting today – has put tremendous strain on the city’s water supply and distribution systems. IBM worked closely with BWSSB to create an operational dashboard, based on the IBM Intelligent Operations Center (IOC), which serves as a “command center” for monitoring, administering and managing the city’s water supply networks. In November 2014, IBM and Veolia announced a new partnership that aims to implement smart technologies into urban services in order to improve the efficiency of municipal systems around the world. A world leader in municipal services, Veolia turned to IBM to transform the way they deliver digital services and solutions for urban resources for cities. The partnership with IBM puts Veolia at the forefront of municipal service providers by offering the industry’s most data-driven approach to municipal services management. Veolia will both use the new set of digital services to improve performance with current clients, and offer new turnkey ready-to-use digital solutions to other cities. IBM and Veolia will first deliver new solutions for Smarter Water, incorporating the IBM Intelligent Water software which allows for better utilization of Big Data , and provides a management system for the integration, optimization and analysis of all data related to water management. Designed to help cities operate more efficiently, provide better service to citizens and ensure effective management of resources, these innovative solutions enable them to address some of their most pressing needs and make cities a better place to live for their residents. Oracle, an innovative software company that provides solutions to utilities companies around the world has many big data analytical tools to help water consumers monitor consumption. Its meter data management system connects meters to the utility company and each other so that they can communicate within the smart group network in order to provide smart services for customers and distribute water most efficiently. The smart grid sends data and alerts from smart meters and sensors directly to the application that needs them. Field investigations can be conducted from a central office and adjustments can be made within the system in order to solve problems; or a worker can respond more quickly to fix the problem on site. Smart workforce management systems create real-time, field technician schedules and routes based on constantly changing data. Size and priority of emergency are quickly sorted through the network by location so that dispatchers can assign field workers and vehicles to ensure the highest possible efficiency and effectiveness. In the customer contact center, quality service is enhanced with pre-written scripts, service prompts and notifications of the progress of work near homes and businesses. Utilities can use smart systems to cut costs by integrating voice response systems, steering customers to self-service websites and varying billing cycles in order to keep call volumes relatively level throughout the month. Oracle has also developed a cloud application called “Oracle Utilities Cloud Analytics” which has been developed to assist in data analysis with a keen understanding of the underlying data structures and the business context in which it serves. The platform is delivered with a library of analytical tools for complex, individual utility use cases. One of the largest areas of opportunity for meter data usage is in grid operations. The utility cloud aggregates interval meter data from the grid in order to display meaningful trends used for improved forecasting, planning and asset reliability. One challenge involved with the services is sorting and leveraging an enormous amount of data in order to produce timely insights on grid and individual device performance. Another involves deriving comprehensive end-to-end insight across entire distribution networks. There are the type of issues that are typically solved through R&D. The water infrastructure in many parts of the world is far older than the infrastructure used to distribute electricity. Many of the water mains buried under city streets around the world are several hundred years old. Conversely, most electrical infrastructure has been erected within the past century. The electrical grid issue has received notably more publicity as a result of the “smart grid” movement. It seems that water utilities have been overshadowed during the era of the smart grid perhaps because they are not so much in the political spotlight or that consumers take water for granted since it is generally significantly cheaper than electricity. Whatever the case, the report made clear and most would likely agree that water is an equally important resource as electricity in which supplies and production issues are equally as pressing. The report then went on to discuss the causes of the water shortage problems which are due largely to climate change, population growth, agricultural expansion, environmental policy, hydro energy and unequal distribution of resources around the globe. Finally, the report then went on to discuss possible solutions to the water shortage problem, many of which involved upgraded infrastructure and leak prevention strategies combined with innovative software that would assist with asset management . The worldwide water shortage issue is a large one. Cities, water technology companies and utilities are facing new challenges in providing high quality drinking water while keeping costs and energy usage at a minimum. Water analytics provides a potential, partial solution to the issue. Federal and State R&D Tax Credits are available to support the costs of innovation.